> Interesting. Massive quantities of water in a tomb? Unless that's sarcasm to others here, I'm not sure why you wrote that. I certainly never called it a tomb. And this is certainly not the first time someone has thought about water in G1 as part of its original function. > of the Antechamber portal. Sorry, I just don't see that erratic damage as indicating any erosion. Water would not carve such a sharp "V"
> this stoneblock and what I was trying to explain. The damage is too erratic to be the original design, in my opinion. It's likely why the SCA felt the need to "restore" it. > east and west of the valley. > extreme perspective of the photo. The photo was taken by the Edgars who described the Step as "broken to a considerable extend in the middle". They did not refer to it as showing any erosion or as part of the original design. > drag something up the GG into the KC. > V" (I'm using your own words here). Yes, since we don't know what might have been found up there, we have no idea what shape, size, or weight it was, so we don't know whether any of those blocks needed to be carved out to allow such booty proper passage. Meanwhile, how do you explain that huge gash in the west wall of the portal to the Antechamber and the similar gash taken out of the west ramp wall below the Step? 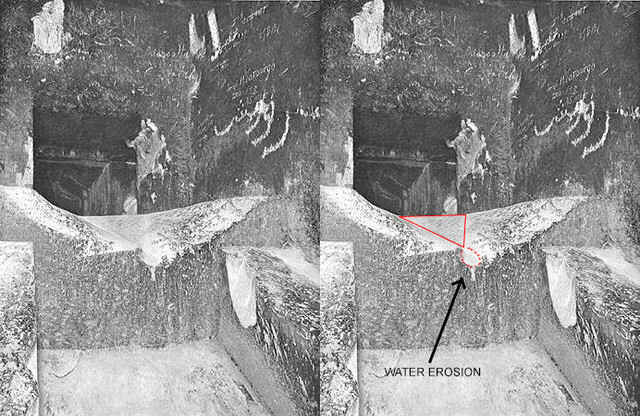 Also, if that much water came down that V to cause a visible erosion of that stone at all, why do we not see any erosion on the floor of the GG under that V? Edited 1 time(s). Last edit at 15-Aug-17 16:48 by Origyptian.